Fresh crab is a delicacy that is widely available in supermarkets already cooked. Reheating cooked crab can be tricky because, while it needs to come to a safe internal temperature of 165 degrees Fahrenheit, you don’t want to dry it out. 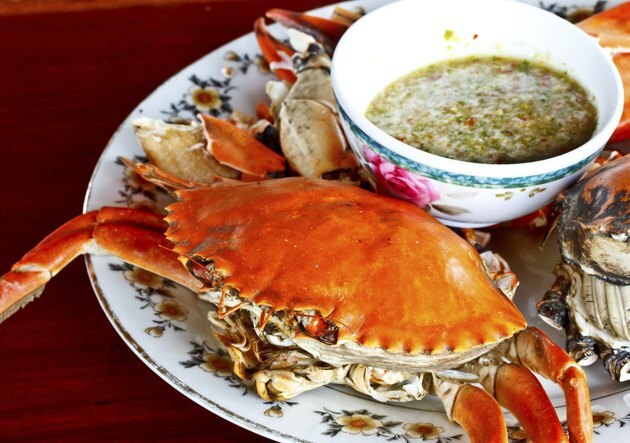 The best way to reheat cooked crab is to steam it, as this cooking method helps prevent moisture loss. You can also microwave or bake cooked crab as long as you are very careful with the timing. Spray a baking sheet with nonstick cooking spray and arrange the crab on it. Bake the crab for 10 minutes or until the meat is heated through. Arrange the crab in a single layer on a microwave-safe plate. Cover the plate loosely with a damp paper towel. Microwave the crab for one to two minutes on "High." It is done when the meat is hot throughout. Place a steamer basket into the bottom of a large pot. Add enough water to reach the bottom of the steamer basket but not cover it. Place the crab meat into the steamer basket and cover the pot tightly. Steam the crab for five minutes or until the meat is hot throughout. Reheat loose crab meat by sautéing it quickly in a little bit of butter and white wine. Do not overcook crab because it becomes tough and dry.